Orange County Wing Chun Kung Fu Association classes available at Saddleback College. Alan “Bak Fu” Vasquez Sifu, the founder of Orange County Wing Chun Association, will be available at Saddleback College for Wing Chun group or private lessons Wednesdays from 3:00-5:30pm and Tuesdays and Thursdays from 10:30-11:30am. Call 949 929-6026 for an appointment. Let me change your life. The Orange County Wing Chun Association is the original (over 29 years) family-owned and oriented, “closed door” Chinese martial arts school (“kwoon”) in Orange County, California. Wing Chun is a true Shaolin Kung Fu style that was passed down by family to the Late Grandmaster Yip Man, who passed the art to Grandmaster Wong Long Ching who is living and teaching Wing Chun (Ving Tsun) today in Hong Kong. Grandmaster Wong Long Ching, Grandmaster Wong Tock, Grandmaster Wong Shun Leung taught Grandmaster Yeung Biu (Yeung Tin Yao), who was one of the last persons to receive the Late Grandmaster Yip Man’s approval to teach Wing Chun in Hong Kong prior to his death in 1972. Grandmaster Yeung immigrated to Honolulu, Hawaii in 1971 and was introduced as Sifu to Stanley Au Sifu’s students and thereafter began teaching in Hawaii. He opened his own school in 1973. In 1977, Master Bobby Cheng, Master Robert Tome, Master Donald Swain and Master John DiVirgilio were the principal instructors of Yeung Sifu’s Kwoon at the Armed Forces Y.M.C.A. in Honolulu. 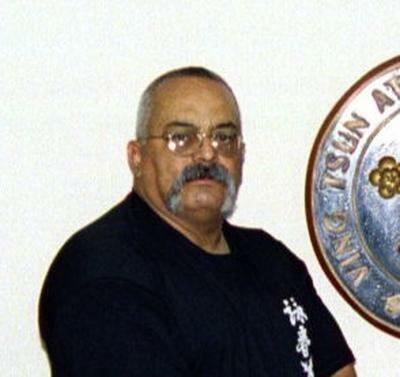 Master John DiVirgilio was principle as Chief Instructor for many years before he succeeded Grandmaster Yeung Sifu as the Chairman of the Hawaii Wing Chun Kung-Fu Association in 1996. Master DiVirgilio and Bak Fu were daily training partners in college and the friendship-student relationship (“Si-Dai Si-Hing” or “younger-brother elder-brother”) continues to this day. Alan R. “Bak Fu” Vasquez started his studies in 1977, was granted permission to teach Wing Chun by Grandmaster Yeung in 1979, graduated in 1979 from Chaminade University, Honolulu, was commissioned a Second Lieutenant in the U.S. Army, Infantry branch and then started his active duty as an officer. In 1978, during her residence in Hawaii, Mrs. Diane “Simo” Vasquez became a student of Grandmaster Yeung as well. She became the first woman to be promoted to Advanced Student Blue-Shirt Black-Sash with 2 Blue Stripes. Bak Fu Sifu returned to Hawaii from 1981-84 and assisted instruction under the guidance of Grandmaster Yeung, Master DiVirgilio and Master Arthur Kodani while stationed as an Infantry Officer and later as a Military Intelligence Officer with the 25th Infantry Division at Schofield Barracks and the DCSINT, WESTCOM, Ft. Shafter. CPT Vasquez left active duty to attend law school but was injured while assigned to 1st Special Forces Group, and was subsequently retired from active duty. He later graduated Juris Doctor in 1988. Orange County was the place of origin for Bak Fu’s family and his first students began here in 1979. Bak Fu Sifu and many of his graduate students are recognized as Instructors with the Ving Tsun Athletic Association (V.T.A.A.) in Hong Kong, the association started by Late Grandmaster Yip Man. To date Bak Fu Sifu has had more than 500 students he has trained as members of the Orange County Wing Chun Association.